"I don't think The Pixies will ever play together again as a band...A reunion gig? It doesn't seem right or something. It seems wrong, so I would say probably we won't do that. I don't know, it just doesn't seem like the thing to do." Hello again, and welcome - this time for real - to our new server. While we thought we had moved back in November, all that had happened was the files and databases had been copied across. A miscommunication led me to believe that the DNS had been updated so people looking for FB.Net were brought to the new server, but no, it was still pointed at the old one. We went along blissfully until quite recently, when discrepancies started cropping up. And then the move was made for real. It's taken a bit of time, but most of the site is back and operational. Unfortunately, the heart and soul, our forum, is still suffering from some severe database problems. Not only are recent posts lost, but the ability to post new topics is non-existent for the time being. To avoid further complicating the problem, the forum is closed until we can find a solution. I apologize for the unheard of downtime and hope that it will all be resolved soon, if not for my sanity then for your convenience. Meanwhile, all the best to everyone in the new year, and you will see us again. Just a quick note that after a 20-hour straight session on the internet and a 30% reduction in hair, the FrankBlack.Net forum is back. There are still a few kinks and twists perhaps (please let us know if you encounter any), but for the most part everything appears functional. Unfortunately, some conversation has been lost, but we'll make up for that in no time I'm sure. Thank-you for your well wishes and patience, we'll see you on the forums! "Black Francis payed a Pre-core set outside St Stephens Green Park gates just after 5pm Feb 9th. He had to play outside as park closes at 5pm. Just Frank and acoustic guitar. "I was very close to him and it was amazing ... Quite a large crowd present and Frank was taken away in a police car afterward for 'safety' reasons! Read the NME report here. The setlist was mostly Pixies material, perhaps to compensate for an absence of Pixies songs in the show later that evening. A complete list of all precore locations (some with drinks after!) are posted on Black Francis' official site forum. Those wishing to get a little bit of Black Francis in but unable to make the show may be interested in checking out Frank Black live on BBC 6 Music's Nemone show, Wednesday Feb. 13 from 1-4PM GMT. Oh, the humanity! Dean and Brian are back in what must be the most-difficult-to-produce podcast of our generation, Podcast 30 of the FrankBlack.Net Podcast. But who cares?! What's more important is that you can now download/buy/etc SVN FNGRS , the new Black Francis release direct from eMusic. Whatsmore, you can download it free as well as the new Seus EP (see below) and a few other tracks to boot if you sign up by clicking on the album art on the left. Not up on the download? You will notice, as well, that the physical disc is available at FrankBlack.Net Store for your pre-ordering pleasure. Whatsmore, the album comes to a local record shop near you on April 15th of this year, and, from all reports, is an exciting addition to the rapidly burgeoning Black Francis catalogue. You can, of course, hear a track from the record on the new podcast. Oh yeah, the podcast. Recorded over the expansive oceans between New Jersey and New South Wales, edited in Singapore, and uploaded in Malaysia, it is finally ready for consumption the world over. In it? Well, you'll have to check it out and see, but it is our first enhanced podcast to date. This means that finally, finally, you can skip past endless banter and jump right to the song. We like to hope you'll just use it to get to replay your favourite parts of the podcast, but hey, we're realists. You can find the podcast here. Back to Frank Black Francis discussion (of which there is plenty, by the way, in the new podcast), the mini-LP version of SVN FNGRS has been available for approximately a month in most places. One of the songs on there is called The Seus, a song which, as Mr. Francis puts it, "chronicles his travels as a young man from his home to Athens where his father is. He’s come to claim his rightful place next to his father so he has to pass by the six entryways to the netherworld and he has to fight all these thieves, I didn’t get to hit all six entries though, because I ran out of time!" You can get this song remixed by Charles Norman, Bloc Party, and Infadeles on a released-yesterday Seus EP. Grab it from eMusic here . There's so much news that it is daunting to sit and write a news report, but here's something else that stuck out as fascinating. For all the budding videographers the internet has revealed, The Bureau, the faceless behind-the-scenes entity controlling the Black Francis world, has put out the call for treatments for the song When They Come to Murder Me. "We would like to invite fans to submit treatments for a music video for the song WHEN THEY COME TO MURDER ME from Black Francis' SVN FNGRS mini LP. We can't offer cash for the ideas, but we will fully credit our winner and send them some cool stuff from The Bureau. Please note that that the video clip will be shot guerilla style (like the recent I SENT AWAY video) so keep your ideas in this DIY realm so that we can fully realize your artistic vision! Email treatments to info@blackfrancis.net. There is no deadline, per se, but we'll let you know when we have a winner." Oh, there's more news, so much more, but that's enough for one round, don't you think? We'll leave you to grab the news albums, EPs, and podcast coming your way at an incredible pace. Don't forget to discuss on our forum and on BlackFrancis.Net. Violet sends us word that the newest addition to the Frank Black clan has arrived! Jude Oliver Francis Thompson was born May 1st just in time for lunch; he takes his place in the clan as the fifth, after Julian, Annabelle, Jack, and Lucy. 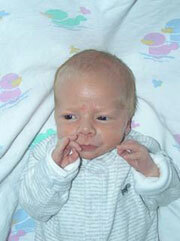 Jude was born 6 pounds 14 ounces, 1'8", and at the Sacred Heart Medical Center in Eugene, Oregon. The hospital keeps baby birth announcements and trivia on its site, and Jude Oliver's can be viewed by clicking on the photo above. Violet and baby Jude are doing fine. Congratulations to Violet and Charles from all of us here at FrankBlack.Net! Rumours have been bouncing around on the FrankBlack.Net Forum like a pinball in a rock polisher. Black Francis Opening for Stone Temple Pilots, a barrage of shows in June/July, a fundraising show in Portland, the list goes on and on. Well, we decided it was time to get to the bottom of it. We asked a birdie, who was in turn swallowed whole by the Show Me Your Tears cat, which went to its owner who called a friend that knows somebody, and that somebody's cousin sent us some interesting news indeed, though tentative and subject to change, you heard it here first. Black Francis will indeed be on tour this summer. This June and July, he will be spending about two weeks touring with the Stone Temple Pilots, interspersing a few solo shows in the mix. I would like to draw special attention to the show on June 12, a show in Portland, OR, to help Duane Jarvis raise funds in his battle with cancer. Details here. If you can't make the show but would like to donate anyway via Paypal, please click here. On behalf of FrankBlack.Net, I would like to wish Duane a speedy recovery. Again, this is all tenative but comes from a fairly likely source whom, on pain of death, cannot be revealed. Dates will be added to our tour page when they have become official. Stay tuned to our news page as we will be releasing small clips of very exciting news throughout the week! If you've been counting, you might be thinking, "Sure, eight fingers are great, but what about the other two?" You've played SVN FNGRS until they were each of them Bluefingers and like any rabid fan you still want more. Well, good! Coming very soon to the BlackFrancis.Net website, in fact it should be out in the next week or two, a USB drive of some BF music should be available from BF.Net only. The Jump drive will contain a live show from Hotel Utah in San Francisco on Oct 19, 2007. Thirty live tracks await. The setlist from the show, in no particular order (thanks moksha23x) is: I Burn Today, Bluefinger, Velouria, Angels Come to Comfort You, Wave of Mutilation, All My Ghosts, Test Pilot Blues, Sister Isabelle*, Cactus, Sir Rockaby, Headache, Space is Gonna Do Me Good, Brackish Boy, I'll Be Blue, She Took All The Money, Your Mouth Into Mine, Bullet, Massif Centrale, Horrible Day, Manitoba, Holiday Song, Nimrod's Son, Tight Black Rubber, The Water, and Deadman's Curve. And speaking of live web exclusives, BlackFrancis.Net will also be releasing a live disc from his 2007 European tour later this year. No word yet as to which show or a tracklisting, but for those who missed the European tour, this should be a hot ticket indeed. 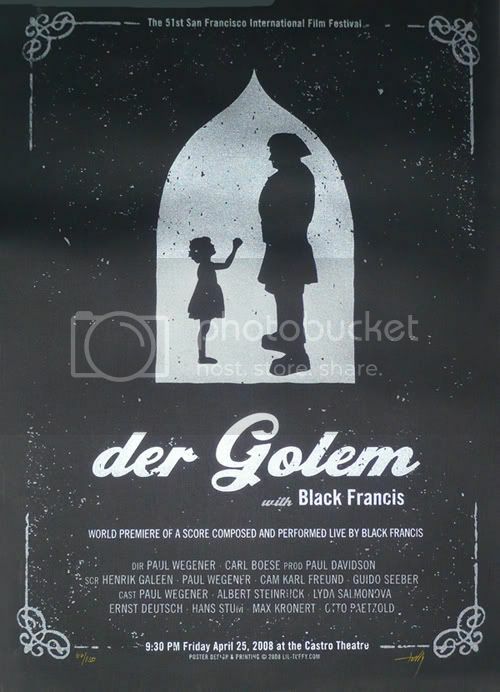 As for the Golem soundtrack, a score written by Black Francis to an old silent film, details are still coming about its release but it seems likely that it will be towards the end of this year and the beginning of the next. It has received lots of critical acclaim and was produced by EDF, so this too is hotly anticipated. It will most likely be an official release rather than a web-only exclusive. Finally, what you've all been waiting for: Grand Duchy. A release date is still in the works, but we do have confirmation that "Grand Duchy IS coming out this year". Specifics are yet to come, but you'll be sure to find them here when available. All indications are that this release will come before Golem, but as always on in-progress news of this sort, it is subject to change. All said and done, it should be an interesting second half of 2008 for Frank Black Francis fans the world over. Two live albums and two new 'fingers' to add to the Black Francis catalogue. Toes soon to follow. * Sister Isabelle is a cover of a Del Shannon song and may not be included. Good news for those with both feet firmly in the digital world: loudQUIETloud, the somewhat controversial documentary on the Pixies reunion and cast of characters has now been released by New Video on iTunes. So you can grab it, download it, and never lay a finger on your DVD drive's eject button much less venture to several stores attempting to find it. Unfortunately, it is (for the time) only available in the US, but American Pixies fans can pick it up here. For those outside America, say Canada or Australia, there is other news. Dates are starting to trickle in for upcoming Black Francis shows in both coutnries and can be expected to continue in the coming days and weeks. Keep a firm eye on our Tour Page for the latest in confirmed shows and dates. Lots of news from the man himself, via his BlackFrancis.net website! First of all, the USB drives of the Black Francis gig at the Hotel Utah Saloon in San Francisco, CA from October 2007 are now available in the Black Francis webstore. The drive contains 30 tracks, ranging from FBF's entire career - be sure to pick this one up. And while you're at it, why not grab a new SVN FNGRS shirt! We also have learned that Eric Drew Feldman is finishing up a number of mixes on various versions of the score to Der Golem that BF and company debuted at the San Francisco Film Festival a few months back. Plus, BF was kind enough to grace our sister site, Blackolero!, with the first exclusive tune from Der Golem: Bad News! Go to Blackolero to hear the track, and we hope the rest of this album reaches our grubby little hands sooner rather than later! We have also confirmed that the Grand Duchy CD release will be happening in 2008 and the band is already gearing up to start its second record (as well as contribute a track to an upcoming tribute to The Cure). Also of note: BF is in the studio this week with Pete Yorn - whether this is for a future Yorn or Francis release is yet to be announced. Plus, we have received a few more tour dates for BF's tour down under - however, we are still waiting for the US full-band tour dates for the fall - as soon as we hear something, we will let you know. Finally - good news for fans of the Catholics! The long-rumored FB &The C's boxed set appears to be happening! We, the fans, have been asked to send in any live photos we have for potential inclusion - so scour your hard drives, closets and photo albums for all those amateur shots of Frank, Dave, Rich, Scott, Dave, Eric and Lyle and send them over via the Black Francis website. 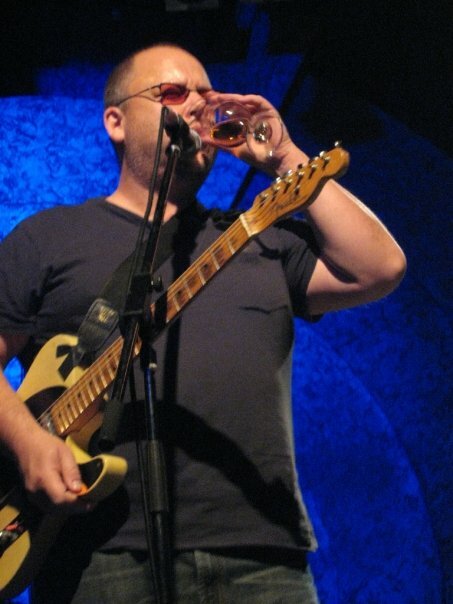 For all the skinny, check out BlackFrancis.net and as always, stayed tuned to FrankBlack.net. With Brian safely married and Dean in one piece and now back in Canada, there was little for them to do but get back to work on FrankBlack.Net. After some serious work on the forum's core, turning over the keys of the Discopedia to forum member Coastline, passing along tour date management to Franktaper, and most recently our tab section to Lonsesome Fetter, it was finally time to get back to one of our favourite features: The FrankBlack.Net Podcast! This podcast is our first attempt at including video, specifically an excellent video by forum member moksha32x for the Svn Fngrs song Half Man. As well, it gave us the chance to include small song tidbits and trivia while the song was playing but for the most part, this is still the old audio program you've come to know and love. Haven't you? What?? Not subscribed? Well, visit our Podcast Page and you will find convenient buttons to add us to your iTunes or other popular podcast platforms. You will be treated to exclusive and rare tracks, interviews, hand-selected live performances, and more. Oh yeah, and it's free. In addition to the new podcast, we are going to make a more concerted effort to bring news here and not just on the forum, where most of our news breaks. You can expect more regular news every few weeks. So while you're busy subscribing to the podcast, you might as well as the FrankBlack.Net News Feed to your favourite news reader or aggregator. And don't forget that lots of our news comes from you, the fans. If you have some news or rumour, please pass it along in our recently revamped news submission page (and again, please note that this is not in anyway a link to Frank Black, the Pixies, or his management). Finally, we would like to thank a few people for their past help with our site and the overall Frank Black online project. Firstly, our French friends over at the excellent Blackolero (link to site translated in English by Google) for keeping up with the news in our absence and doing some excellent features including a recent 3-part interview with Violet Clark. Secondly, to Tre, who put in a lot of tireless hours working on our Discopedia and moderating the forums on her own for far too long. Thirdly, another nod to the French, Denis for all the years keeping Frank Black's tour schedule up to date and accurate here. And finally, to Derek Olson for his long-time efforts first as ratbert and then ProverbialCereal keeping up with Frank Black in our tab section. But now we have a new wave of volunteers (we can always use more) and a new era of Frank Black under the moniker of Black Francis, and we are now formally ushering the site into its third era just as the podcast reaches its third season. Suggestions are, as always, welcome, and we look forward to many more years of Frank Black Francis fanaticism. Frank Black Francis is on tour in Australia at the moment, the first time in a very loooong time without the Pixies. At this very instant, the lucky people of Perth are showering, getting ready, and cranking out their favourite FBF tunes in preparation for a show there tonight. And woe, what shall become of the rest of the planet? Well, we can tune into RTR FM's pretty cool interview with the man of the hour on the internet on the Breakfast with Barr Show. He talks about beach balls, stage patter, the Pixies ("c'est fini" for those holding on to hope from rumour-monger NME), and more. Thanks to Avram (enjoy the show, buddy!) for pointing this out and stay tuned in a few days for the second installment of our third season of the FrankBlack.Net Podcast. Looking to hear something from Frank Black you've never heard before? Well, I bet you've never heard this. In fact, nobody had but a select few up until this evening. Black Francis is 'featured' (according to the credits) with Violet Clark (who is not credited) on the recent Brownies episode of Tim and Eric Awesome Show, Great Job! with singing the Brownie Mountain song. And it is, if painfully short, surely worthy of the 'awesome' moniker. And, most importantly patient reader, you can watch it here! Both FB and Violet are, "big fans of comedians TIM AND ERIC. We were honored to be vocalists at the end of [this last] episode," says Black Francis, fresh from a blistering gig in Perth, Australia which early reports are just beginning to trickle in from. Old standbys like Calistan, Horrible Day, and newer tracks from Svn Fngrs, most of Bluefinger, and even Gary Green's Burnt Out Rock and Roll are making appearances on tour and FB is performing a solo acoustic set before the full band emerges. And pulling out an old trick, he even took crowd requests for a major or minor key. Black Francis and band are hopping in a rather random fashion all over Australia for the next few days, with an appearance in Adelaide tomorrow, Brisbane, Melbourne, and finally Sydney before returning home to get Grand Duchy and the Der Golem soundtracks out the door. If you have the chance to see him in Australia, this is highly recommended. If not, well, check out the Tim and Eric show and obsess about absentee desserts. After tuning in, make sure to visit the Podcast Season 3 thread over in our forum and let us know what you think! At long last, after a year of wonder and wait, we at FrankBlack.Net have received a report from a very reliable - but sworn to anonymity - source. Grand Duchy, at least for the moment, is to be handed from FB and Violet to you on February 1st of next year. Yes, in four months, you'll have Grand Duchy spinning in your player. And, though our source was mum on the topic, Der Golem may well be in your hands by then, too. That's it from the underground for the moment, but stay tuned for more news we anticipate in the coming weeks. As you may remember, Grand Duchy - the Frank Black/Violet Clark project that is currently drawing a lot of attention - was slotted to do a cover for the American Laundromat Records' Cure Tribute disc entitled "Just Like Heaven". Well, the cover is blown and out there on the internet along with the rest of the disc, available for your streaming pleasure. Just select the Grand Duchy track, A Strange Day, after you click here. The track, which is a collaboration between Frank Black and Violet (and nobody else) features some excellent vocals from Violet, a healthy dose of synth, a driving bass line, and of course some nice guitar work. You can listen to the entire album, including the title track from Joy Zipper, and a cover of "The Lovecats" from Tanya Donelly. As for the album itself, it hits the streets January 27, 2009, but if you preorder you can get an advance copy at a special price and receive it "in time for the holidays" complete with bonus track, promo pin, and a chance to win an FB/Violet autograph on your disc for the pretty great price of $10. And no, we are not in anyway profiting from this particular piece of news, but we know a good deal when we see it. So get your next dose of Grand Duchy and Cure (you see what we did there?) your anxiety as you await the February release of "Le Petit Fours", the first Grand Duchy album. Lots of little news tidbits have been trickling in over the past few days, so let's get right to it. According to BlackFrancis.net, there will be a box-set release of Der Golem! Whether this will be the only format the record is released in, or if there will be a single-disc version remains to be seen. However, we can safely say that the box set will include some sort of document from the screening live performance at the Castro Theater during the San Francisco Film Festival from earlier this year. Also from BlackFrancis.net, the video for "When They Come to Murder Me" will be released sometime before the end of the year. The video's concept was fan-submitted, so it should be interesting to see what our fellow fan came up with! Finally, exclusive to Podcast 33 (just released), we have some information about the upcoming Black Francis/Isaac Brock/Larry Norman/Guards of Metropolis collaboration. Trouble is a Lonesome Town, a 1962 album by Lee Hazelwood, has been recreated by the aforementioned cast of characters and is almost complete! Charles Normal, brother of Larry Norman, guitarist in Guards of Metropolis, and guest on Podcast 33, tells us that only one more vocal needs to be recorded, and that we should see the record out in February or March on Slackertone records. Stay tuned, as always, for all the news that's fit to put into an RSS feed, here at FrankBlack.net. First of all, we apologize for the delay of Podcast 34 - but we promise it will be worth the wait! We will unveil our delayed Halloween episode on November 15th - it is so good it is SCARY! Also, friend of the site, Ben Sisario, author of the book Doolittle in the 33 1/3 series writes a fantastic blog called Crimes Against Music. This past week, he wrote a great, hilarious article called "Exposed! 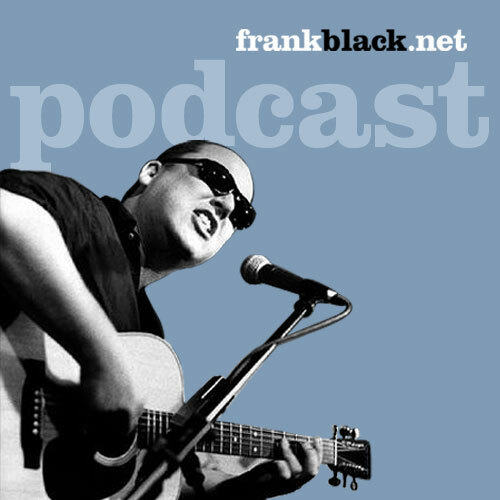 The Real Frank Black" - we suggest you check it out! We will be back with more news soon - including (we hope) a Golem update and, as we approach the Feburary release date of the debut Grand Duchy album, we will do our best to bring you all the pertinent news!